For months, the pace of demolition of Palestinian homes had slowed, and human rights activists dared hope that this scourge had passed. Last Monday’s events, unfortunately, proved us wrong. In the bucolic Palestinian village of Kifl Harith, Israeli soldiers were as awful as they have ever been against an innocent civilian population. Defying the Fourth Geneva Convention on human rights, as well as elementary decency, two families were violently evicted from their homes, which were then razed to the ground. The army had also used African guest workers to remove some basic possessions from the houses before the bulldozers did their work. The homes and most of the contents, however, were utterly destroyed. The Israeli Committee Against House Demolitions, in which several peace organizations participate (Bat Shalom, Gush Shalom, Peace Now, and Rabbis for Human Rights), called for a rebuilding of these homes, and the weekend had been set aside to begin. The army, however, had learned this technique, and declared the village a ‘closed military zone’, prohibiting anyone from entering or leaving. Roadblocks were set up at the two entrances to the village, and soldiers patrolled the village perimeter. The villagers were virtually imprisoned in their own tiny area: none in, none out. A group of about 100 of us from Jerusalem and Tel-Aviv – Israelis and internationals – gathered opposite the village at about noon, determined to hold a demonstration, even if we would not be able to begin the reconstruction. Quite visible in the hills across from us, about 3 kilometers away, were the luxurious homes, buildings, and swimming pools of Ariel, a large Israeli settlement. Ariel settlers have no trouble getting building permits, and enjoy generous government mortgages, loans and grants. In addition, Ariel residents receive significant income-tax benefits just for living there (as do all Israeli settlers). Across the road in Kifl Harith, not a single building permit has been issued in the past 30 years, and the village has no paved roads, sewage system, or other basic amenities. The contrast is shameful, shameful, shameful. I say this as an Israeli. The group of peace and human rights activists gathered at an access point leading into the village and demanded entry. The soldiers blocked our way and demanded that we leave. Our large group began to walk along the main road toward another access point, knowing full well that we would be blocked. Suddenly, Gail from Jerusalem broke rank and began to walk across the field toward the village. It seemed so simple, and a group of us followed her, spreading out to make it harder for the soldiers to stop us. The soldiers came at us quickly, grabbing us to prevent our progress. I made a quick head count of them and climbed on a mound to call out, ‘There are many more of us than soldiers, just walk peacefully through, no violence,’ A few more broke ranks, but soon the soldiers were running back and forth to stop more of us from walking through the field. Against some, the soldiers were more violent than others. Gail was forcefully thrown to the ground. My arm was well twisted. Although the soldiers were blocking us only with their bodies – twisting arms, pushing, grabbing – I guess it was the M16s slung across their backs that prevented more of the larger group from following us. In the melee, 7 of us made it past the soldiers and walked the 5 minutes through the fields into the village. When we came out on the other side, we discovered – by chance or not – that we were all women who had taken the risk and gotten through to the village. It gave us food for thought. Together, we walked to the site of one demolition and found the families and neighbors gathered outside the tent in which the family of four now lived. Husam the father, a slight, soft-spoken man, spoke to us as his 4-year old son maintained a tight clutch on his pants. He described how 5 tear gas canisters were lobbed into the home to evict them and their neighbors, who had hunkered down inside. In the ensuing chaos and escape from the fumes, the 2-year old had been left behind until the father raced back in, emerging with his child unconscious from smoke inhalation. Was this the only way to remove unarmed adults and infants from their home? The mother took us on a ‘tour’ of her former home, now a shattered dream of broken concrete and twisted pipes. She explained the difficult economic straits – that her husband could not get a permit to work inside Israel because he was under 30, and the authorities don’t issue permits to young men, viewing them as more likely to be terrorists than older men. With the 2-year old in her arms, she reached down in the rubble and picked up something that looked like a hand grenade. ‘Rifle grenade #400’ was printed on it in English. The smell of gas still lingered on it, but the child did not know enough to be afraid. As we listened, we noticed a commotion down the road, and saw that some of the village young men had placed rocks across the dirt road to prevent army vehicles from entering their village. This is like a red flag to the Israeli army, with its proprietary message, ‘This place is ours, not yours!’. Soldiers suddenly appeared in the distance and raised their weapons toward us, moving ominously forward. Several Israeli women quickly moved out to be visible to the soldiers, and Susi Mordechai shouted across to them, ‘Hey, guys, cool it, don’t shoot, we’re just having a little talk here.’ My heart was in my throat, but they didn’t shoot. Then one of the Palestinian young men wrapped a scarf around his face and began the motions of releasing his sling shot at them with a heavy rock inside. ‘Put it down,’ Susi told him, and were relieved when he lowered his arms and moved back toward the village. Now we were joined by a group of CPTers (Christian Peacemakers Team), who had circled around the village and entered from the back. By cell phone, we called the group outside and were told that, following negotiations with the army, a delegation would be allowed through. Within an hour, we saw a group walking toward us along the access road – Jeff Halper and Amos Gveertz of the Committee, Uri Avnery of Gush Shalom, Ya’akov Manor of Peace Now, and others. It was a striking contrast that the self-appointed delegation was almost all men, though it was only women who had shown their mettle and broken through. The village dignitaries met them warmly and gave them the tour as well. Then all of us constructed a symbolic wall at the site of one of the demolished walls, and pledged to return to help with the actual construction. We then left peaceably – returning to our own comfortable houses. Israel TV did show a segment of our demonstration on the main road, but all the media, foreign and local, were prevented by the army from entering the village today. This is the way oppression is maintained – by keeping it out of sight. Many of us, however, have recorded it in words and photos. It must be documented in history, engraved in our hearts, and spoken about in the world at large. This is a task not for those who wish to speak evil of Israel, but, first and foremost, for those who love it. First, my unstinting applause and admiration for the brave young men and women of CPT – Christian Peacemakers Team in Hebron – who threw themselves in front of the army’s guns, which stopped the soldiers from firing into the crowd of Palestinians who were peacefully demonstrating. That happened this past Sunday. The background to the story is a shooting one week ago by a Palestinian of three Israeli settlers who drove into Hebron from the nearby settlement of Kiryat Arba (one was seriously and the other two lightly injured). In retaliation, the Israeli authorities imposed a curfew and a closure on the entire Palestinian population living under Israeli jurisdiction. Not only is such collective punishment a clear violation of basic human rights, but it was done during the month of Ramadan, when Muslims fast from dawn to dusk, and must be allowed to make food purchases for their traditional evening meal. Needless to say, closure and curfew also prevent access to jobs, medical services, school, and other basic amenities. The Palestinians came out to demonstrate and the Israeli soldiers came out for the usual face-off, which often ends in shooting, injuries, and sometimes death. Fortunately, the media were there to capture the moment: Pierre Shantz from Canada and Sara Reschly from the United States, two members of the non-violent CPT group based in Hebron, spread their arms and stepped in front of the rifles pointed at the crowd, calling out, ‘Don’t shoot, this is a peaceful demonstration’. In the films taped of the event, you can clearly see Pierre and Sara moving their bodies back and forth to block the barrel of the gun, not giving the soldiers a clear shot at the demonstrators. There were no Palestinian casualties that day. Sara and Pierre were both arrested, set for an arraignment the next day. The courtroom was full of peace activists from Bat Shalom, Rabbis for Human Rights, and the Israeli Committee Against House Demolitions. And when the judge ruled that they would be released with payment of a bond of 4,000 shekels (about $1000 US), the money was raised on the spot when all those present reached into their pockets. I hope someone keeps this footage of the heroic action of these two brave people, and writes a school curriculum about it to teach peace and nonviolence. Some of you may remember Lena, the 15 year-old daughter of the Shawamre family, whose home was destroyed last July by the Israeli ‘civil administration’ of the Occupied Territories. Many of you have asked how Lena is doing, and I wondered myself, not having seen her since that day she stood beside me, her face contorted with pain and fear as the bulldozer smashed her home into rubble before her eyes. Yesterday, the Israeli Committee Against House Demolitions (which includes Bat Shalom, Rabbis for Human Rights, Gush Shalom, and Peace Now) was invited to have Ramadan evening dinner with the Shawamre family. Over 6 months have passed since that fateful day, and the family and the Committee have done a lot together. First, of course, we helped the family and their neighbors rebuild the home. Then, we stood beside them to witness the second demolition. Ever since, Jeff, Yoav and others from the Committee have spent hours trying to help them get a legal permit for their home. And yesterday, we finally spent some festive time together. We were a group of 8 Israelis, and we sat together at the neighbor’s home, where the Shawamre family is now living. There are now sixteen souls in this one medium-sized home. The men of the Palestinian families, the six Israeli men, and we two women from Bat Shalom all sat on foam pads in the living room, mounds of good Ramadan break-fast in front of us. The feeling in the room was incredibly warm. We had a big laugh over one of the demands of the ‘civil administration’ (CA). In the application for a construction permit, the Shawamre family was told they had to submit an affidavit stating that there were no claims on the land by anyone else. They submitted this paper and attached the signatures of many neighbors as evidence. No, the CA told them, 2 signatures are missing. Which 2? This the CA refuses to reveal. This story, while seemingly preposterous, is an unexaggerated fact of life, and not at all unusual in the Kafkaesque dealings of Palestinians under occupation with the so-called ‘civil’ administration. When the meal wound down, I asked to see Lena, and she entered the room together with her mother. I was surprised by what a beautiful girl she is, not having noticed then, with long dark hair spread over her shoulders and down to her waist. Lena sat next to me and shyly answered my questions. She’s in 9th grade now, but her grades have fallen since her home was destroyed. From a grade point average of 97, she now averages 75. But, yes, she loves school and hopes to grow up to be a teacher of Arabic. I could see she found it hard to have this conversation. I just tortured her with one more thing – I gave her the dove of the Israeli women’s peace movement – kissed her on both cheeks, and let her escape out of the room. Maybe some day she’ll teach Arabic to me or my grandchildren, insh’Allah. Moskowitz is in Israel surveying his new property in Ras al-Ammud – a totally Palestinian section of East Jerusalem (the Palestinian side), where Moskowitz plans to build a new Jewish settlement. At Bat Shalom, we had a call from Peace Now saying that Moskowitz would be at Ras al-Ammud in 30 minutes, and could we join them for a demonstration. Veteran picketers that we are, we lettered a bunch of signs and arrived at Ras al-Ammud just in time to meet him. I liked our signs. The two I held said, ‘Take your corruption back to Miami’ and ‘Jerusalem ain’t bingo – Beat it!’ Not polite. Nor is the violence that will ensue if this settlement goes up in the midst of this Palestinian neighborhood. Not surprisingly, the police did not like where I was standing with my signs: on Moskowitz’s property. They informed me of such, and I moved just outside the fence. But from there, I was not willing to move. There was a difference of opinion, I peacefully resisted and explained my right to demonstrate. The police disagreed, and I was dragged away to the van. They were less gentle than they could have been, but it also could have been worse. I was arrested, charges were filed for ‘disturbing the public order’ and ‘resisting arrest’, and I was released on bail when Ronni Livni from Peace Now came back to the police station to co-sign the bail note. Thank you, Ronni. And this is a good moment to point out the cooperation of all the peace organizations these days. It hasn’t always been so. But I extend my personal and organizational gratitude to all the organizations that have worked together so well in recent months. And to our allies among the Palestinians who work together with us, non-violently, to make life better, ultimately, for both sides. This morning we buried Inbal, an Israeli woman, born and brought up on a kibbutz. In the afternoon we buried Elias, a Palestinian man, from the West Bank village of Beit Sahour. And in the evening, we buried Yohanan, a religious Jew from New York who had immigrated to Israel. The three could not have come from more different backgrounds – backgrounds that symbolize the conflict. But in reality, the three were partners in peace: senior staff in the Alternative Information Center (AIC), struggling for a just solution to our national conflict. And as of today, they became partners in death as well: killed by a flash flood that surged through the canyon near the Dead Sea where they were hiking. Inbal, Elias and Yochanan worked for the AIC, a joint Israeli-Palestinian peace center headed by Michel (Mikado) Warschawski. It was a staff trip, and Mikado and the others managed to cling to the rocks when the raging waters suddenly surged through the area. The other three were swept away. Palestinian and Israeli peace activists shared a bus today, moving from cemetery to cemetery. We prayed in each other’s sanctuaries, eulogized each other’s loved ones, and cried in each other’s arms. It was not about an act of political violence. It was about living and dying together as if our nationalities and religions didn’t matter. Elias Jeraisse from Beit Sahour was 38 years old. He was the father of two sons, aged 12 and 5, separated by 7 years – those seven years that Elias had been a political prisoner in Israel. Two of those years were spent as an ‘administrative detainee’ – imprisoned without trial. Elias had been editor of the Arabic-language publication of the AIC. Inbal Perelson, a 38-year old Israeli born in Kibbutz Amir, was recently appointed editor of AIC’s Hebrew periodical. Inbal was known for her incisive analysis of the range of social-political issues in Israeli society. Her literary essays frequently graced Ha’aretz. Yohanan Lorwin, 45 years old, had moved to Israel from the US. He was a lawyer by profession, and worked as assistant editor of the English-language publication of AIC. Yohanan, a religious Jew, was soft-spoken and self-effacing. These three, working together, had dedicated their lives to peace. We shall miss them terribly. And as we interred them in the cold earth today, it was clear that their deaths had brought us even closer together. Today we mark Israeli Independence Day. Yesterday we marked Memorial Day. The confluence of the two days is intentional and appropriate. 19,000 Israelis have been killed since 1947 in wars, terrorism, and other conflict-related events. How many Palestinians, Lebanese, Syrians, Jordanians, Egyptians, and others have been killed? Probably many more. I move that Memorial Day be redesignated a day for all sides to mourn all the victims of this violent conflict, Israeli and Arab. And that we use the day to reflect upon the need to bring this blood-soaked conflict to an end. As always, this season presents an occasion to evaluate our national achievements, shortcomings, and – above all – the road we are traveling. As last year, the Yesh Gvul organization (advocating conscientious objection to army service in the Occupied Territories) offered an alternative torch-lighting ceremony to counter the official version. In our – the people’s – ceremony, torches were lit by those who have distinguished themselves in struggle for a more just and peaceful Israel. Sha’arban and Majid Kazamel: A Druze couple whose son was killed in a helicopter crash on his way to the war in Lebanon. 53 young men from their Druze town of Beit Jann were killed in the lifetime of the state of Israel. Neta Amar: An activist lawyer with the Association for Civil Rights in Israel, who has been outspoken about many issues, especially Mizrahi oppression. Jeff Halper: Coordinator of the Israeli Committee Against House Demolitions (ICAHD), who spoke eloquently of looking for a way to end the cycle of destruction of Palestinian homes. Donna Birenbaum: Young and energetic advocate to end the abuse of foreign workers in Israel. Michel (Mikado) Warschawski: Veteran peace activist, who cited the plight of Palestinian refugees throughout the world and inequality for Israel’s Arab citizens. 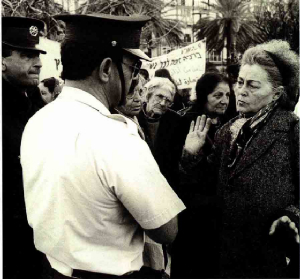 Attalia Boimel: One of the Mothers and Women for Peace, who declared that unless Israel arrives at a peace soon with Lebanon and Syria, Israeli mothers will stop sending their sons to serve in the army. Duddi Maklev: Active in the Keshet – Mizrahi Rainbow organization, which seeks ways to end Ashkenazi hegemony and to democratize Israeli society. Hanna Friedman: Co-founder and head of the Committee Against Torture in Israel, Hanna was one of the first to expose torture as a routine procedure used against Palestinian detainees in Israeli prisons. Dedde Beniste: Founder of a community organization in a poor neighborhood, Dedde has relentlessly pursued public housing solutions for the poor. Eyal Reuveni: A journalist who sat in prison for his refusal to serve in the Israeli Army as a guard of Palestinian prisoners. Amos Keinan: Well-known Israeli writer and novelist, who dedicated his torch to Emil Gruensweig, a young Israeli killed by a hand grenade thrown into a peace demonstration by an Israeli right wing extremist. Last night’s ceremony last night was held in Emil Gruensweig Park. What brought tears to my eyes was the quiet presence in the audience of Salim and Arabiyye Shawamre, mother of Lena, whose home was twice bulldozed to the ground within the past year. This couple has every reason to hate Israel. But thanks to Jeff and ICAHD, Israelis have been there for them throughout – to express support, solidarity, and help rebuild their home (twice). The presence at the Israeli ceremony of Salim and Arabiyye is living testimony to the power of efforts for peace and reconciliation. And on the subject of home demolitions, things are heating up. Last Monday, two homes were destroyed in Ussawiye, an Arab village which borders Jerusalem, but has been declared part of Jerusalem by the Israeli government, thus making them particularly vulnerable to efforts to rid the city of its Palestinian inhabitants. The village has consistently paid a high price for its location – homes destroyed, residents killed in clashes with the Israeli police, and land confiscated by the Israeli government to build the Jewish neighborhood of French Hill. Can you believe that this village also has a group of Palestinian women engaged in dialogue with a group of Israeli women from adjoining French Hill? I am appending below an abbreviated version of a letter from the Hope Flowers School, just outside Bethlehem. This well-named school is unique in the Palestinian Occupied Territories for its teaching of peace and reconciliation. No other school in the territories brings together Israelis and Palestinians or provides Hebrew-language instruction to the children, taught by Israeli volunteers. There is no school more deserving of support and less deserving of destruction. And yet they are now slated for demolition, based on a zoning law that has not been updated since 1942 – and which is applied only to Palestinians, not to Israelis in the territories. We are frankly horrified that the formal channels have yielded only intransigence. We must act immediately to avert this tragedy. Please send e-mails and faxes to the relevant bodies in a sample letter that I am sending separately. May next Memorial-Independence Day bring 19,000 flowers to cover the graves with hopes for peace. Home demolitions are continuing and have even been stepped up recently. So be prepared for requests in the coming weeks to express your voice of protest. The good news is: Your messages have made a difference! 1. One of the four e-mail responders at the State Department told me personally that Madeline Albright receives more e-mail about home demolitions than about any other issue related to the Middle East. We assume this is also true of Bill Clinton’s office. 2. Clinton thought the issue of home demolitions so important that he included it in his list of demands about peace in the Middle East that he threatened to reveal if Netanyahu would continue his intransigence on the Oslo Accords. The information about inclusion of this issue is taken from a range of media reports to that effect, clearly leaks by Clinton’s office. Indeed, Clinton’s office had to leak the contents of the plan for his threats to be taken seriously. 3. In a private meeting with members of the Israeli Committee against House Demolitions, Avigdor Kahalani, our Minister of Internal Security, complained about receiving ‘too much’ mail about home demolitions. A senior official from the ‘Civil’ Administration (those who issue and implement demolition orders) voiced the same complaint. 4. In late August 1998, the Civil Administration announced that 2,000 homes would be taken off the hit list, with some exceptions. This number was later reduced to 700, but it still means that tragedy has been averted for 700 families. 1. A US State Department official told us that the Department is furious over Israeli demolitions of Palestinian homes. She described the State Department as ‘more agitated and angered about this issue than I have seen them about any other issue’ and reported that they have demanded close monitoring of the situation from the staff in Israel. 2. A high-level officer in the US Consulate in Jerusalem has asked to be present at an upcoming hearing at the ‘Civil’ Administration about a home which has appealed its demolition order. 4. The European Delegation in Israel had Jeff Halper, coordinator of the Committee Against House Demolitions, brief its staff members in Jerusalem about the issue of demolitions. 5. The count of homes destroyed has dropped from a total of 233 homes in 1997 to a total of 147 homes in 1998. Although we may lose a battle over any one house, many other homes may be saved by the struggle, as officials are reluctant to evoke further public wrath. In recent weeks, however, the pace has increased, but that’s why we’re launching a major campaign next weekend (stay tuned). 6. This very week, two homes in the village of Jabel Mukkaber, on the verge of demolition, were granted a stay order, thanks to a lawyer brought in by the Committee who managed to obtain a postponement, which he believes can be extended until the order is canceled. Unfortunately, 40 (!) homes in this pastoral village alone are under threat. The Coalition arranged for a meeting this week of all the villagers with a lawyer from the Association for Civil Rights (Israel’s ACLU). Also, a representative from the European Delegation has asked to be present. We – in Israel, Europe, and North America – have together been effective. And one related case that also belongs in the Book of Effective Action: Many members of the Jahalin Bedouin tribe have just signed a compromise agreement with the Israeli authorities that will grant them land in a more reasonable area than the garbage dumping grounds where they were violently transferred last year, and will receive some compensation for rebuilding their encampment. The agreement is far from perfect, but is an important and positive precedent. This was also the result of citizens’ action advocacy – the Rabbis for Human Rights, Bat Shalom, several politicians, the good lawyer Shlomo Lekker, and all your letters! Thank you for the many letters of congratulations. They are so welcome! Below is my take on what happened. Sorry if I burden you with what my daughter calls ‘too much information’. Maybe it was just my need to share the good – and the bad – news. Netanyahu has been soundly trounced, losing 56% to 44% to Ehud Barak. Even more than savoring victory, we feel enormous relief that this corrupt, deceitful and hate-mongering politician is no longer prime minister of Israel. To quote Ya’akov, the baker near me, ‘I woke up this morning feeling that I had just been released from prison.’ That’s how many people felt. Netanyahu had worked hard to win the hatred of so many in this country and even his own former allies, many of whom had deserted him for ‘centrist’ parties. He incited Moroccan Jews against European Jews, he whispered in the ear of a senior rabbinical leader that ‘the seculars [nonreligious Jews] aren’t really Jewish’, he told the market vendors that ‘the elites hate you’, he arranged the printing and distribution of a deliberate mistranslation of Barak’s autobiography, and he did everything in his power not to keep the peace agreements that he himself had signed, blaming others for it. On Election Day itself, Netanyahu defied Israeli law that prohibits electioneering on that day by granting live radio interviews…after being reprimanded by election officials and apologizing to them, he promptly did it again. Hearing the results of the victory produced euphoria; the feeling of release spread like wildfire. In a spontaneous outburst that began late at night when the polling booths closed and the exit polls shows a landslide victory, tens of thousands of Tel-Aviv residents gathered at the plaza where Yitzhak Rabin had been assassinated over 2 years ago and sang, danced, kissed, wept with joy. ‘Peace, peace, peace!’ they chanted to every peace song they had ever come to believe in. It was not surprising that amid the sea of Israeli flags, the rainbow flags of the gay movement waved prominently, symbolizing hopes for an end to despised religious coercion in every area of life in Israel. It did not just feel like a victory of one politician over another. It felt as if the liberal, democratic, and peace-oriented citizens of Israel were extricating their country from three years of darkness and despair. That was the best part of the elections. 1. A vote against the character of Netanyahu, discussed above. 3. The growth of the ultra-Orthodox parties, particularly Shas, which increased its power by 70% in the Knesset and became the third largest party (17 seats), just a whisker behind Likud, which dropped 13 seats (and now stands at 19). Clearly the biggest story of the elections was the transformation of the fundamentalist Shas party into a major political player. This party, supported primarily by lower income Moroccan Jews, was swept in on a tide of fury over the conviction of party leader Aryeh Deri on fraud and bribe taking at the height of the election campaign. ‘He’s innocent,’ declared the Shas campaign slogan, both vindicating their hero and casting aspersions on the court system. But voting for Shas was more than protest over an allegedly unjust conviction; it expressed rejection of the hegemony of Ashkenazi (European-Jewish) culture in Israel with its concomitant discrimination against and disdain for Mizrahi culture – that brought by Jews from Muslim countries. Now add to Shas the other parties in support of religious legislation (United Torah Judaism and the National Religious Party), and you have a pro-theocracy bloc that has grown 17% (from 23 to 27 seats). Speaking of blocs, the extreme right wing – those who refuse territorial compromise with Arabs – has maintained its power if you consider that the openly right wing parties (National Religious Party and United Nationalist Party) will be buttressed by the Russian-immigrant party led by fascist Avigdor Lieberman. And that’s not even counting members of the Likud and Shas who can be counted on to vote against compromise peace agreements. In the center, we saw an overall shrinking of the major parties: Barak’s ‘One Israel’ party (Labor plus satellites) lost 7 seats, while Netanyahu’s Likud party lost 13. The newly invented Centrist Party picked up only 6 of those losses, the rest going to Shas and anti-Shas (Shinui). Finally, the left: little change. Meretz held its own and Hadash lost a seat. But the message of these two parties about peace has hopefully permeated much of the new One Israel movement. The stark question now remains: With whom will Barak form a coalition? He has already announced his desire for a ‘broad’ one. He does not want to repeat the Red-Green format of Germany. Barak is himself a ‘centrist’ and he wants as large an alliance as possible; for this he is clearly willing to sacrifice the purity of those on his left. He will surely bring in Sharansky’s immigrant party, which held its own, and the Centrists, led by Yitzhak Mordechai, whose leaving of the Likud turned a leak into a hemorrhage. Neither of these parties represents a yearning for a just peace with the Palestinians, just a desire to rid ourselves of the problem. Barak will also want to bring in either the Shas or Likud party, both of which have been less than peace-oriented. And we hope that Meretz will also be included, although they are jockeying to prevent a Shas presence, and they may be exclusive alternatives. The upshot, in my opinion: We will see a ‘centrist’ government committed to as cheap a peace as it can get away with – with Palestine, Syria and Lebanon. We may see improvement on social issues, which everybody has been promising. And religious legislation will be a threat that continues to hover. Barak has already been reaching into the Bible for enriching his acceptance speeches. Let’s hope the Bible remains an inspiration and does not become a platform of action. Finally, before allowing ourselves to sink into the minutiae of political bickering that clearly awaits us, let us take a moment to rejoice. Toppling Netanyahu has really been a release from prison. It was more than the result of partisan efforts. It was also the result of a widespread grassroots mobilization – from the ‘Women Vote Peace’ campaign of Bat Shalom to the thousands of volunteers who staffed polling booths, preventing the widespread fraud that had taken place last election day, to the thousands of Israelis who returned home to vote. Everyone played a crucial role. There’s no one to thank. We were all doing it to save ourselves. Why did Peace Now cancel its demonstration at Har Homa (Jabel Abu-Ghneim) last Thursday? The idea was a good one: to tell prospective building contractors that the construction of yet another Jewish settlement in occupied Palestine does not augur well for peace. But when the Palestinians declared that same day to be their own ‘Day of Anger’ to protest such settlements, Peace Now decided not to risk a re-run of the previous week’s violent face-off with the army at Ras al-Amud, another settlement site. So a group of ten Bat Shalom women went to the meeting point, collected two Peace Now activists who also didn’t want to cancel, and together we drove just south of Jerusalem and up the dusty mountain road, where we unfurled our signs. Other intrepid climbers were the international media, but the building contractors seemed to care little as they drove past us in their Mercedes-Benz and BMWs. I’d like to think that they did ponder the meaning of our message – ‘Har Homa is an obstacle to peace’ – but I imagine that the glint of money to be made outshone the moral issue. At least the media carried a few words of our message, perhaps trickling down to their children. But now ‘Day of Anger’ drew us onward, and when we heard by cell phone that Palestinians were demonstrating in Bethlehem, our group headed that way, promising each other to avoid riots, but to express our solidarity. We parked at the entrance to the city and walked past Rachel’s Tomb, a Jewish religious site that looks more like a fortress than a shrine. Indeed, the Israeli soldiers on guard there scowled as we walked past with our posters calling for peace, indicating, I presume, that they regard a pro-peace attitude as a lack of support for their work. More accurately, it was a lack of support for the politicians who put them there. The large Palestinian demonstration had already broken up, but we gathered the last vestiges of media and spoke our piece publicly – two states for two nations, and settlements are an obstacle to peace – and went home. We made it into the local Jerusalem cable TV channel, Ha’aretz newspaper, and, most fortunately, Palestinian TV stations, which were glad to hear of support for the cause of peace on the Israeli side. 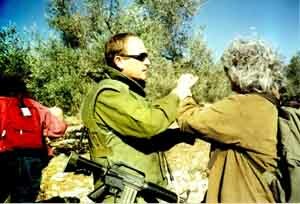 That same day, Gush Shalom demonstrated together with Palestinians near Nablus, but I don’t have details other than hearing Uri Avnery say that soldiers took aim at them to break up the demonstration, but then refrained from firing. As usual, Palestinians in other parts of the territories were not so lucky, and several were wounded and one killed. The next day, the Christian Peacemakers Teams (CPT) in Hebron organized a protest against land confiscation in Hebron, this time for use as a gas station for settlers. Bearing a banner reading, ‘This gas station is built on confiscated Palestinian land; it fuels occupation and pollutes peace’, the mixed Palestinian-Israeli-CPT group marched past Israeli soldiers and police guarding the station and held a short rally. Speakers from CPT, the Palestinian Land Defense Committee, Gush Shalom, and Rabbis for Human Rights spoke, as well as two members of the family who own the land on which the station was built. Then an olive tree was planted as a symbol of peace and continuity. Shortly thereafter, the police ordered the group to leave, which it did after singing, ‘We Shall Overcome’. No arrests were made, although soldiers took pictures of everybody before they left. For their scrapbooks. On Saturday, the Movement of Four Mothers led a cavalcade of cars from the Lebanon border into Tel-Aviv, and then a large protest in a public square. Hundreds participated, and the coverage on the main TV news that evening was extensive. In my opinion, this movement is yet more evidence of the impact of citizens’ action in making peace. As a result of large scale unhappiness in Israel about the war in Lebanon – triggered by the activity of Four Mothers – both Barak and Netanyahu promised to have the Israeli army withdraw from Lebanon within a year, if elected. Now is the time for Barak to keep his promise, and the Four Mothers Movement is not letting up until it happens. Sadly, this morning’s news brought a report of the killing of yet another Israeli soldier in south Lebanon, and presumably more Lebanese suffering. This action was initiated by Yesh Gvul, and enthusiastically attended by Bat Shalom, Gush Shalom, Committee Against House Demolitions, Hadash, and some members of Meretz (who made a point of criticizing their own party for objecting to Shas membership in the government coalition). Winners on the Palestinian side – Political leaders Abu Mazen, Abu Ala, and Faisal Husseini; and human rights activist Bassem Eid. Other winners – Oslo facilitators Terje Rod Larsen and Mona Juul, and U.S.-er Stanley Sheinbaum. The ceremony was fittingly held in the American Colony Hotel, which had been home to so many PLO meetings over the years, when words less pacific were uttered. After hearing all the speeches on Tuesday, one simple sentence remained with me, spoken by Abu Ala, the speaker of the Palestinian Legislative Council: ‘I’m optimistic that there will be peace,’ he said, and everyone nodded in agreement. And these are the people now in power. We’ll be supporting – and prodding – you on your way. I think it’s accurate to say that the peace camp is still hopeful but anxious about our just sworn-in prime minister. Although Barak has disappointed us by not having any Arabs in his cabinet and only one woman, on the peace issue he insists that he will not let us down. In yesterday’s meeting, Egyptian president Mubarak showed warmth and a ‘soldier-to-soldier comradeship’ (Israeli media terms) for Barak. Oy. Couldn’t they just act like kissing cousins? This week, Barak meets with President Arafat, King Abdallah, and Emperor Clinton – a leader a day. Everyone but Clinton has a breastplate of combat medals across his chest (and Clinton has been trying to decorate his own chest with a barrage of warplanes). In an interview yesterday, Barak said that the state of Palestine already exists de facto, and that the only thing left to do is to separate Israel from the potential threat of that state. A few comments: The fact that Barak recognizes the ‘de facto’ existence of the state – preparing the ground for recognizing legal existence – is wonderful. However: (a) All of us still have much work to do by way of educating about the need for a viable Palestinian state. Isolated enclaves do not a state make. (b) What’s this about separation? While I am in favor of 2 separate states, there will be no stability or security in the region without enormous economic strides to develop Palestine, which also means intense economic cooperation with Israel. And (c) It’s really quite ludicrous for a country as strong as Israel to worry about the potential threat of a Palestinian state. Time to end our demonization of the Palestinians. Hillary Clinton’s election ploy notwithstanding, the only way to have a durable peace is to share Jerusalem. In a presentation at Bat Shalom last Tuesday, Dr. Menahem Klein, senior researcher at Bar Ilan University and author of Doves Over Jerusalem talked about the ‘colossal failure’ of all of Israel’s governments to unite Jerusalem, which, for all practical purposes, remains divided to this day. On the positive side, Menahem discussed the extensive negotiations that have taken place in formal and informal channels to find a way to make Jerusalem the capital of two sovereign states, and he elaborated some of those solutions. It’s only a question of will, said Menahem. He added that far less work has been invested in finding a solution for the settlements, and therefore they pose a greater challenge to peace at this stage. On Friday, Dr. Kathy Ferguson of the University of Hawaii made a valuable contribution to understanding the militarism that permeates Israeli society by her analysis of the military complex in Hawaii. Co-sponsored with the US Cultural Center, Kathy’s remarks carried that unmistakable ring of subversiveness in which women are sometimes allowed to indulge because what harm, after all, can women do J. A good deal, we know, and Bat Shalom invites women interested in subverting the military-industrial complex to join our consciousness-raising group this fall. No Israeli government has ever had more than one woman cabinet minister, and Barak promised significant improvement on this issue too, but then appointed only Dalia Itzik to the post of Environment Minister (unfortunately, considered a minor position in Israel, in comparison with the big guns – sic – of Treasury, Defense, and Foreign Relations). This is infuriating, and a series of demonstrations ensued, today’s being the biggest. Bat Shalom joined several hundred women from the Israel Women’s Network, Na’amat, Wizo, Emuna, and others to protest outside the PM’s office. The IWN had great signs, showing how poor is Israel’s record in comparison with other countries. Bat Shalom’s signs carried our particular view: A Peace Government Needs Women. And I looked regretfully across the street (unable to be in two places at once), where a handful of men staged their own protest against Barak’s complete ostracization of Arabs from his cabinet. Never – even once! – has Israel had an Arab minister. And Arab citizens comprise 20% of the Israeli population. Yesterday’s housewarming was truly heartwarming, as hundreds of Israelis and Palestinians gathered at the newly completed home of Samir and Arabiyyeh Shawamreh, commemorating one year since its first demolition (there have been two), and celebrating the triumph of our determination to right that injustice. There were speeches by leaders of every Palestinian and Israeli peace organization that had participated in the collective rebuilding, but the most eloquent of all were the eyes of Lena Shawamreh, now 16, as she smiled out at the crowd of new friends and allies gathered at her new home. We dedicated this a ‘Peace Home’, as the sign (in Arabic, Hebrew, and English) now affixed to their front door reads. Who would dare demolish a home with so much love and hope suffusing it? And Atta Jabber, whose own home near Hebron was rebuilt and demolished 3 times, stood by quietly, awaiting his own turn for a housewarming. It will come. We promise. The ‘Civil’ Administration has destroyed another home. Not just any home, but one with 7 children and a disabled father. And while they were at it, the soldiers arrested the father and a 15 year-old daughter who had the nerve to try to protect their home from the bulldozer. It’s no wonder the father and daughter were a little upset: This was the fourth time the Civil Administration has destroyed their home – once a real house, then increasingly simpler shacks to replace those that were demolished. Beyond the enormous personal tragedy of the family, this demolition has great political significance – it is the first home destroyed under the Barak administration. That’s why we must respond at once, and in a massive way. Barak must have an opportunity to reject the policy of demolitions before his administration is guilty of more, and feels he has to defend them. And Shlomo Ben-Ami, new Minister for Internal Security, must be encouraged to overturn the entire policy, which originates in his ministry. With great sorrow, we note the passing of Yaffa Gavish, known to all as Yafka, who passed away after a courageous struggle with cancer. Yafka’s life was dedicated to her ideals – peace with the Arab nations, justice for the poor, equal opportunity for women, and an end to nuclear arms. She was a vibrant, wise, and dedicated leader of many organizations – the Israeli Communist Party, Hadash, TANDI, Israel-Cuba Friendship Movement, Na’amat, Gesher LeShalom, Marwa, Israel Women’s Network, Committee to Free Vanunu, Women in Black, and our own Bat Shalom. Characteristically, she donated her body to science. Yafka was a smart, kind, and wonderful woman, who served as a role model for so many of us. All of her actions were touched by her quiet integrity and dignity. She will be deeply missed. It was a traditional Christmas Day for the Palestinian town of Beit Sahour, 5 kilometers south of Jerusalem, which held its annual ecumenical Procession for Peace through the streets together with many Israeli peace activists. The Israeli-Palestinian organization Rapprochement, as always, deserves our gratitude for organizing it. Many of us have attended this march since the Intifada years, when the Beit Sahour residents, in a mass act of civil resistance to the Israeli occupation, refused to pay taxes to the Israeli government, which responded by confiscating cars, furniture, and valuables from their homes. The procession took on a new and optimistic spirit several years ago when the Oslo Accords granted Beit Sahour semi-autonomy together with the nearby city of Bethlehem, and Palestinian police for the first time showed up to ‘secure’ the marchers. I remember my own mixed feelings at seeing these first Palestinian soldiers – a complex symbol of incipient sovereignty and force of arms. But discouragement grew in the following years as the peace process has been run into the ground by Israel’s right-wing government capitulating to extremists. It was not surprising, then, that this year’s procession was held under the banner ‘A State of Palestine: By Right, not Grace’. And – in reflection of this troubled process – it was also not surprising that when so many things went wrong as the march commenced, the metaphor was so obvious, it was painful. First, 3 huge bunches of helium-filled balloons were released into the air. Two soared toward heaven, or at least toward Bethlehem, while the third caught on a telephone wire and spun swiftly around in circles, caught forever in the time warp of no progress. Then the doves refused to take flight. Imprisoned in a big box labeled ‘The Israeli Occupation’, the box was carried through the crowd on the shoulders of several young men from town. At the given moment, a contingent of Palestinian and Israeli dignitaries bashed in the box, and the resultant breach was expected to look like the window to freedom for the dozen terrified doves inside. They refused to leave. The dignitaries bashed the opposite end of the box, banged on the bottom, clobbered the closed sides, but to no avail. The doves stayed put. Finally, one enterprising young man reached in, grabbed a dove, and threw it into the air, to the applause of many, but the displeasure of the elders who stayed his hand from a further disruption of due process. ‘By right, not grace!’, as the men forced open the top and eleven pure white doves finally soared into history. And the torches refused to catch fire. In what has always been one of the most beautiful moments of the procession, one torch is lit, and then the fire passed from torch to torch, Muslim lighting from Christian, Jew from Muslim, and back and forth among the crowd – young, old, men, women – in an inspired ritual of connection and solidarity. This year, half the torches failed to ignite. Perhaps the significance of the moment was our united effort? But even half the torches cast sufficient light for the march to proceed. Beit Sahour children in dress uniform of the Palestinian scouts movement beat their drums to lead the group from Shepherd’s Field toward town. Beside me, my friend Edy said that when the Israeli scouts someday join this procession, we will know that peace has arrived. We walked in pace to the smart drumming, Palestinians and Israelis mingled, chatting with each other, torches lit and unlit, through the town and into the large yard of the Greek Catholic church school. ‘Only one speech this year’, we were told, as the Lutheran School choir replaced the gallery of speakers with a medley of Arabic songs. And then the skies opened and rain poured down, ordinarily a welcome relief during a terrible drought that has harmed Palestinian and Israeli alike, but we all wished it would have waited another couple hours as we pulled hoods and umbrellas over our heads. But the choir sang on, and within five minutes the rain had ended, and one Palestinian (whose name was not announced) began to speak. ‘We welcome all our friends,’ he said, and then warmed up the politics. He praised Clinton for ‘understanding the plight of the Palestinian children’ and then blamed him for pouring destruction on Iraqi children. He called for a release of all Palestinian political prisoners in Israel. And he called for establishment of the Palestinian state by right, not grace, with East Jerusalem as its capital. This, of course, is Mideast code for two states, side by side, with Jerusalem the capital shared by both. Warm applause all around. By then, some of us had found a ledge to sit on, and the choir launched into a rousing rendition of carols in Arabic which we enthusiastically joined in, arms around each other, and then applauded the school bagpipe band in its wailing Jingle Bells as it marched across the schoolyard. The hot coffee and baklava that followed could not have made it any sweeter. We know that the metaphor does end well, however. That night, very very late, it rained properly. Peace on earth to everyone.